July 39ers Sparkle in the Summer Sun! 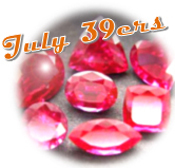 Do you know a July 39er who’s a glittery “gem” in your circle of life? Of course, all 39ers are gems! But everyone seems to sparkle a little brighter during their birth month, don’t you think? Gemstones play a part in our lives even if we don’t subscribe to the tenets of astrology. A popular gift item over millennia, gems have touched us in many fascinating ways. Famed Tiffany & Co. even published poems of an “unknown author" in an 1870 pamphlet, lionizing our birthstones. Their July verse: The glowing ruby shall adorn, | Those who in July are born; | Then they'll be exempt and free | From love's doubts and anxiety. But doesn't the day you were born deserve something sparkly? According to Wiki’s lengthy background of gemstones, there are also birth “day” stones allocated by day of the week! Saturday, for instance, shares two: turquoise and diamond. Perusing gems through history has revealed multiple beauties ruling over each month, astrological sign, and even day of the week you were born. So far, we’ve followed the Gregorian calendar. However, long before our lives were structured by calendars, astrologers of old felt the Zodiac signs needed their own gemstones. They believed each sign and its assigned gem were compatible through symbolism, based on the metaphysical powers they perceived the gem controlled. The Ruby, specified by modern calendar methods, is said to guarantee health, wisdom, wealth, and success in love. Ancient astrologers, however, proclaimed Cancer (June 21-July 22) should enjoy the qualities of the majestic emerald, while Leo (July 23-Aug 22), rules with the mysterious onyx. Based on all the info, I’m for wearing, buying, enjoying, whatever floats your boat!